Direct Virtual Remote is a full function remote control for your home-networked DirecTV system. With nearly ½ million downloads it is the #1 DirecTV remote available for iPhone, iPad & iPod Touch. 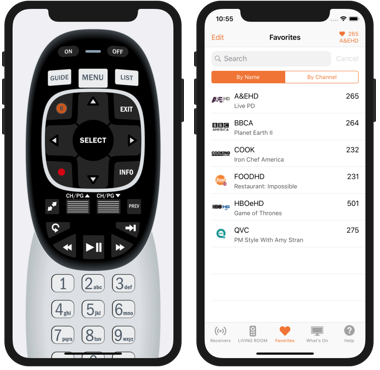 The current version features a full screen remote, compact landscape remote, bookmarks, program guide information, social networking, program sharing and community show list integrated directly in the app. What are your DirectVR friends watching right now? Yes it does... BUT you must have a compatible setup at your home. This consists of network-ready DirecTV receiver(s), a wireless base station and DirecTV's "Home Networking" package. If the app isn't working for you then you do not have a compatible DirecTV system. Make sure your setup at home meets or exceeds the specified requirements. An Apple iPhone, iPad or iPod Touch running iOS 4.0 or later. DirecTV high-definition set-top box(es) models H21, HR20 and newer. DirecTV's "Home Networking" service connected to your wireless router. Setup is simple and takes only two steps. First "Enable" your receiver(s) so they will work with external devices. Then lookup your receiver's IP address and add a new receiver in the app. For step-by-step instructions look at items 1 and 2 in app's Help section. Not every DirecTV receiver made is network-ready and therefore your particular model may not have an IP address. If this is the case, you will not have the "Network Setup" as an option in your menu. Some receiver's have a "Setup" menu option, and others are called "Parental, Fav's & Setup" the actual naming will depend on your receiver, but it will have the word "Setup" in the title. This means your DirecTV system does not have the "Home Networking" service and will therefore not be able to "speak" to your iPhone. You can phone DirecTV and order this service for a one-time fee. Before you can use DirectVR you must enable your receiver to allow for external devices to access it. Just visit the "External Devices" menu on your receiver and set all of the options to "Allow". If you are still getting an error message, you may have to restart your DirecTV receiver for it to acknowledge the changes. Chances are that your receiver's IP address has changed. Your receiver gets its address from your internet router and it is not guaranteed that you will get the same address every time. Go into your receiver and double-check the IP address. Volume control is not available in the DirectVR apps and it is impossible to add it. Keep in mind that the volume is actually controlled by your television set. It is not controlled by DirecTV or the DirecTV receiver. Television remotes use an infra-red light beam to send commands to the television set. The iPhone/iPad/iPod does not have an infra-red transmitter so it's impossible to send commands to the television itself. DirectVR © 2019 RMR Labz, LLC. All rights reserved.